Who will win the Clinton-Trump debate? I asked my favorite learned futurist. Her guess is as good as yours. Maybe better. If you’re new, or even relatively new to this space, you’ve probably never heard of Madame Galzogorist, the fortune teller to the shmateh trade. She inhabited a shabby room in an old loft building, one flight up in New York’s Garment District. A victim of painted signs that were misspelled (“Readings: $5 Speical,”) and of electrical signs that malfunctioned (see above) she nevertheless provided deep insights into the political unknown. For a nine year old example (my God, have I been at this blog that long?) go here. Crank: Good afternoon, Mme. Galzogorist. 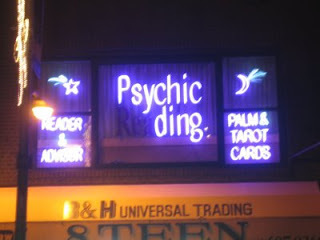 I wonder if you’d give me a reading? I'd like to know the outcome of the first debate between Hillary Clinton and Donald Trump. Mme. G: Did you bring money? My prices have gone up. Ten bucks, minimum. Crank: I happen to have a ten dollar bill here…. Mme. G: That’s all you brought me? Cheapskate! Well, you always were. Now, what was it you wanted again? Crank: Results of the first Clinton-Trump debate? Mme. G: Let me look into my crystal ball here. Ah yes, I see. Buy Corn Futures. Short term. Buy one day, sell the next. Fast in and out. Crank: I wanted political results. You’re giving me investment advice. Crank: But what about the debate? Mme G: I’m trying to tell you. Buy Corn futures. This debate is likely to generate the biggest televised event since the McCarthy-Army hearings of 1950-whatever. Huge audiences. All with their fat asses plunked down on a couch, munching away on empty calories. Many munching on microwave popcorn. Some on pre-popped bags full of the stuff. It’s going to drive corn prices through the roof a Trump tower. Crank: Yes, but the debate results? Mme. G: The results will be an increase in corn prices on the commodity market. Perhaps more of a blip than a bubble, but an opportunity for the agile investor willing and financially able to take a certain degree of carefully-considered risk. Also, potato chips and corn chips. Who’s big in chips? The Pepsi-Cola Company? They own Dorritos, right? And people will need to wash down all that salty stuff with something wet and sweet and bubbly. Buy Pepsi-Cola. Either the stock, or short-term calls. Crank: But who will be ahead after the debate? Mme. G: Chief Executive Officers of snack food and beverage companies. Watch for them to collect humongous end-of-year bonuses. They will fall on their knees, thanking God for Hillary and The Donald. Networks trying to build their audience bases will also benefit. The American people? Not so much. Anybody who has half a brain and who has wrung most of the alcohol out of it is already intimately familiar with the character, vision or lack thereof, and suitability or lack thereof of both the candidates. The rest is all a circus. Speaking of circuses, there may be an opportunity for appliance makers to sell home cotton candy machines here. Spun sugar, that’s what America yearns for. That, and a rich diet of intellectual treacle. Crank: Okay, let’s get to the really big question. Who’s going to win the next Presidential election? Mme. G: For that you’d need to cross my palm with many, many. many fifty dollar bills. Many, many, many. Crank: I’m a little short on fifties right now. Mme. G: So what’s new? Come back when you’ve got more money.